Nick Quarm Synthpop "The Thin Line" did many things - if it didn't impress on the listener as anything original, then it at least sounded like a very very good Depeche Mode influenced Synthpop record. At times darker ("Today"), I recall being rather impressed with the debut LP. After a lengthy gestation, we are back with the first of two EP's : "Pride". The Glaswegian trio appear to have refined their songwriting somewhat, kicking off with the immediately anthemic "We Won't Walk Away". Fast-paced and sincerely intimate, Brown's vocals are evolved in many a sense - although it's clearly the same vocalist, they sound elegant and less strained. This EP has a stonking track opening it - I think the little percussion breakdown during the middle eight may just seal the deal for the listener. 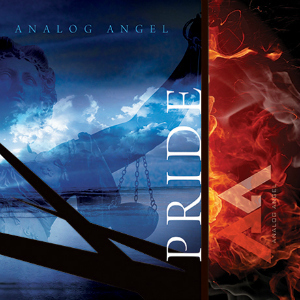 If Analog Angel can keep this up, then we've got a hot, hot record! I knew this would happen - track two "Not Alone" re-introduces the heavier side of the group, sounding a bit more Metallic. The song is about self-harm, and shows us both the ying and yang of Analog Angel - something the debut was very, very keen on doing. Fortunately (and this is a huge, huge plus as the debut was too inconsistent at times), the improved songwriting hasn't dwindled. It could be a sister song to "Today" - the lyrics both echo being alone and isolated/frustrated in your bedroom, and I see similarities in vocal style, not to mention both tracks being second on their releases. "Let It Show" - a resounding, acoustic intro with echoes and effects intrigues me, holding me as some sort of prisoner. The song builds quickly into the vocals, with uncharacteristic effects breaking the usual Synthpop cliché. A little repetitive at times, it's structured well enough to keep me interested. I like the union between bass effects and vocal sections - little things that are oft ignored in lieu of a killer lead hook. "The Temple" is the first track to have an epic sound to it since the first. I love how brooding and fast this is. For me, the group work best when they are pulling off fast paced numbers that test the vocals - although their slower numbers can be great, I love the energy and beat that they seem to excel in. The formula of cycling between styles and tempos permeates the final three tracks of the EP, and I have to be honest, this EP is good - very good, but it is not great. 7 full unique tracks is a seriously good thing, and the songs here are all well-written and definitely heading in the right direction. Personally, I want to see either more tracks like the opener, or a track with a massive, massive hook. I have no doubt that the trio can do this - It's been demonstrated before. "The Thin Line" did many things - if it didn't impress on the listener as anything original, then it at least sounded like a very very good Depeche Mode influenced Synthpop record. At times darker ("Today"), I recall being rather impressed with the debut LP. After a lengthy gestation, we are back with the first of two EP's : "Pride". I look forward to the next EP.